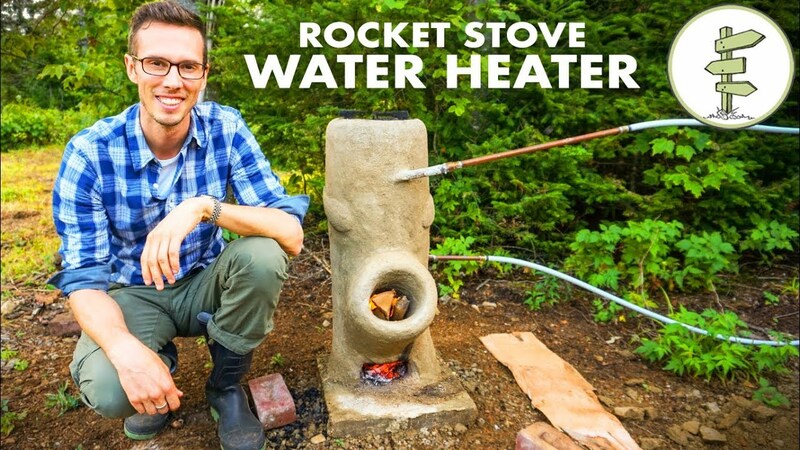 This is a brilliant DIY hack for creating an off-grid water heater with just a simple handmade rocket stove, water barrel, and copper pipes! No pump! No propane! It was built by a couple of incredible people we met last summer, Sebastien and Isabelle. They’re passionate about reconnecting with the earth and finding sustainable ways to live. One of their hobbies is experimenting with rocket stoves and making them function as a cooktop, a heat source, and sometimes even as a hot water heater. A rocket stove is a simple stove with 3 openings: the one at the bottom for building your fire, the middle one is to feed wood to the fire, and the one at the top is a chimney. By winding copper pipes inside the cob walls of the chimney, water in the pipes is heated up and circulated from the water barrel, around the rocket stove, and back into the barrel by a process called: thermosiphon. According to Wikipedia, a thermo syphon “is a method of passive heat exchange, based on natural convection, which circulates a fluid without the necessity of a mechanical pump.” Our minds were blown when we learned about this passive heat exchange that didn’t require electricity or propane! Daisy Rain Matanily how are y’all set for warm water? What sort of water temperatures do you get? How long will it heat water if you just light it once?